CW: Could you say a little about your background and influences? Richa: In a lot of ways I think that my journey is inseparable from my social and historical locations; from the family, neighborhood, friends, and workers with whom I grew up; from my encounters with disability and bonded labor; from my encounters with political writing and political theater, as well as my own immersion into all of this as a child and student. There were deep influences of teachers, of family members, and of people who spent time with us. Despite all of the important theoretical critiques of experience, I do feel that there’s something critical about experience that formulates the fundamentals of our consciousness as we are growing up. It shapes how we come to think of politics, and how we come to think of ourselves as political beings. One of the things that is striking for me, in my own journey, is that academically I never really studied anything specifically political or “radical” until I — completely by accident — came to the MacArthur Program at the University of Minnesota in 1989 as a graduate student (what is now called ICGC). So here we were with Allen Isaacman, Bud Duvall and others whom they brought together, the anti-apartheid struggles are at their peak, and Minnesota suddenly is this place where every exciting conversation is happening—on post-colonialism and post-structuralism, on feminisms, on anti-apartheid struggles. August Nimtz, Allen Isaacman, Bud Duvall, Susan Geiger, Prabhakara Jha, Eric Sheppard, Ron Aminzade, Helga Leitner: these people were very influential for me. I was twenty-one at the time I became a part of this intellectual community, but prior to that, my political education was happening through Hindi and Urdu literature and through Bengali and Russian literature,all of which I read in Hindi translation. I was also influenced by participating in protests, and in various creative and “social work” activities in middle and high school. One of our teachers, Ms. Cornelius, took us every Saturday, from school, to one of Mother Teresa’s hospitals for people with leprosy. This work she framed in Gandhian language. She also organized “Sarv Dharma Prarthna Sabhas” or prayer meetings from all faiths, where we learned Zoroastrian, Christian, Sikh, Buddhist, and Jain prayers along with verses from the Quran and Gita. At home, I heard stories from my grandparents and father about what the partition of India and Pakistan meant for each one of them as they lived those years scattered as a family in Agra, Lucknow, and Mumbai; the ways in which they participated in India’s struggle for freedom from the British; and the profound influence of Gandhi on them. A man whom I call Baba ended up joining our family in 1937 and remaining with us until his death in 1996. He initially left his home and village to become part of the independence struggle and then circumstances brought him to our extended family, and I see him as a very important person, more important to me than my parents or grandparents in many ways. This man, who co-raised me and my sister for more than a decade and a half, never attended a school, but he was full of stories about the politics of partition, about everyday encounters with the British, about all that was humiliating and funny, and about gods and goddesses and saints and politicians. Those stories, told by Baba, Dadadji (my grandfather), and Baa (my grandmother) continue to be the stories that I still sleep with often. Those are the people who formed the very deep parts of my consciousness in early life, and helped me shape the paths I embraced in my own life. Those stories are still what I go back to. In India people sometimes ask me, ‘what party did you first begin your political work with?’ Ms. Cornelius (whom I mentioned before) just turned 84 and she was honored in my hometown yesterday, and I think my first ‘party’ was her party. Without calling herself or her work explicitly political, Ms. Cornelius changed more minds and hearts than I have ever seen anyone else transform. She did this work in an English medium (“missionary”) school where children of bureaucrats with big egos were studying alongside with people who came from narrow lanes of the old city, children who never spoke English in their homes, who were embarrassed by the other group. Ms. Cornelius made us grapple with uncomfortable questions such as what did it mean for us to be together in the same learning environment? How did we come to the same texts, the same lessons? She made us think about some of these things by requiring us to labor together. We cooked, cleaned, sold food for social causes, kept accounts, and paid for our own and each other’s mistakes. All these pieces, I think are important elements of how I came to connect with the political and creative work I have come to do, all of which is undergirded by the importance of listening to stories, of telling stories, and of making deep connections with and across stories. At the heart of what I do, which I hope we’ll talk about during the course of this conversation, are affect and trust and the very intimate bonds that we build as part of sustained, long-term political alliance work. I think that all of these pieces from my early years played a critical role in giving me the passion to identify and continue this work. CW: I know that there’s so much you can say about your work, and we’ll get more in-depth on it, but could you say a little about your work with the Sangtins? Could you speak on the role of strong, affective relationships in that work? Richa: When my first encounter with the Sangtins happened, I had completed my Ph.D. as well as my years on the tenure-track. Through most of the 1990s, I had been immersed in research and writing on race, caste and religious politics among South Asian communities in postcolonial Dar es Salaam. I also began my first (tenure-track) job in a geography department of a US university, which was a big shock to me in some ways, because when I was a graduate student, nobody ever asked me to defend or prove my work as ‘geography.’ Interdisciplinarity was so deeply ingrained in the MacArthur program that I never felt any accountability to that question. At the same time, my work in Dar es Salaam was touching on some very sensitive themes socially and politically, and as someone who was not from Dar es Salaam or East Africa, I also felt a political resistance by the Asian elite to the issues that my work was raising and to the intimate stories about questions of power that I had been able to write about with help of those who were located at the margins of South Asian communities in Dar es Salaam. (Interestingly, many US academics whom I encountered in those days often assumed that I was from East Africa. ‘Third world’ academics are often expected to return “home” to do research among their “own.”) Due to a mix of reasons, I did not feel that I had the cultural capital to fight that resistance. I was also clear that I needed to continue writing in Hindi and working in North India. 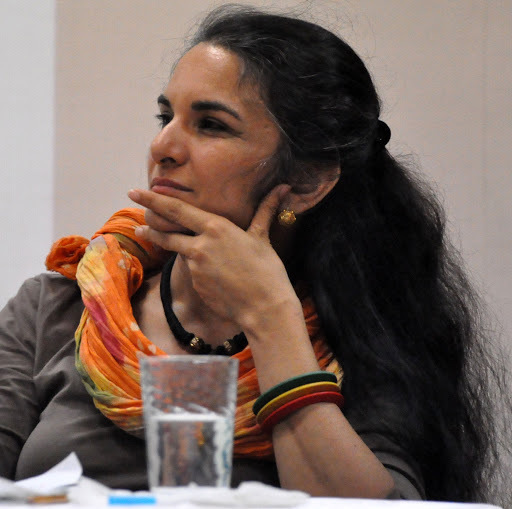 So, a combination of factors led me in 1996 to start working with various movements and organizations focused on the politics of development in India, and I was primarily looking at women’s NGOs working in rural areas of the country. Issues that were recurring included the politics of the donor-driven organization agendas, as well as the elitism in these organizations. There was significant literature emerging from the Global South on these questions, but I also felt that some key stories were not being told and the burden of silences was huge. When you are trying to develop ethical relationships, you cannot betray the trust that people are placing in you, and so I couldn’t find a way to talk about these things in ways that worked for those I was working and learning with. In this kind of work, one thing was very clear to me: There was no point in developing critiques if the critiques could not, first and foremost, be owned by the people who participated in helping to articulate them. In 2001-2002, I became interested in looking at how women’s NGOs in Lucknow and Hyderabad were connecting the politics of secularism and communalism with questions of gender-based violence. But for reasons that had to do with rifts that had happened between activists and academic researchers in the past, this project ‘failed’ and I could never officially begin my research in Hyderabad even though some amazing people in that city shared many critical insights with me. In March 2002, I was coming out of that setback, reflecting on what I had learned, and was about to head back to the US with my 4 year old daughter. And that’s when Richa Singh from Mahila Samakhya-Sitapur (the organization for which we use the pseudonym, NSY in Playing with Fire) came by my parents’ home one day just to say hello to us. I had known Richa Singh because I had been spending time with members in Mahila Samakhya-Uttar Pradesh since 1996, and I had done some intensive work with Mahila Samakhya and Vanangana in Bundelkhand region of India in 1998-9. So Richa Singh came and said, ‘Why don’t you come to Sitapur? You haven’t visited since 1996.’ In 1996, when Mahila Samakhya (MS) was beginning to imagine itself in Sitapur, I had dragged my mother there, we spent a few days doing things, meeting women, and so on. But I hadn’t been back. Partly, I’d not been back, because when I talked with MS officials nobody ever said anything about Sitapur. So, Richa Singh came and started talking about how she was truly frustrated by the politics of documentation, and that people really don’t find out about the solid work that happens on the ground unless someone produces a glossy report about it, too. All of the very important work that they had been doing on the ground just went unregistered, unnoticed, because they were not into report preparation. From there, we got into conversations about NGOization, about professionalism, about elitism, about caste and class inequalities, and so on. And then, she said, that before I left for the US I should come visit. And I did. My daughter came along, and the seeds of a long partnership were sowed that March. Richa Singh took me to a school run by MS. There were about 30 people there, including all the teachers. All the NGO coordinators I’d met previously were always very invested in the stories that the ‘researchers’ should hear. They’d tell women, ‘Oh, tell her about this, and tell her about that…’ Richa Singh, I still tease her: she loves to sleep. She put me in this room at this school and there was this large circle of women, and she just moved the things from in between and covered her face with a scarf, and she was out in a minute. This woman was snoring in the middle of the room, and she was not at all worried about what will emerge from these conversations. This was really my first encounter with a setting where there was an open dialogue, where there was not a preconceived idea of what the researcher ought to do or what reports should be prepared or what the outcome of the meeting should be. It was a free-flowing conversation about issues that the women are facing. I think at that time I could also clearly see my own role. I could see that people had frustrations, but they didn’t have a language to analyze or channel those frustrations into forming a vision. They had been roped into writing reports as part of their livelihood, but I felt that really interesting things could be done with the oral historical or life historical work that they were already doing as NGO workers, that there were ways to turn things around to ask a new set of questions. With the kind of training that I had as an interdisciplinary feminist scholar, especially what I had learned from feminist work in Africa, and the kinds of questions that I had been grappling with about history and place in feminist ethnographic and oral historical research, and so on—I felt that this was where I could be an important contributor, where I could help organize the efforts as part of a team. And we left things there. I think that’s another noteworthy thing: there was not a desire or an expectation that this would turn into a research project. It was just a set of conversations that happened, and I returned to the US. And then we continued to develop those conversations through letters. We continued to grapple with the politics of documentation in the NGO world. The women in MS Sitapur felt humiliated because they didn’t know English, and because they were not able to convince other people in MS that the work in their district was as important as the work in other districts. There were handwritten letters going back and forth, and a lot of phone calls. I’d just make weekly phone calls and talk to people. The conversations emerged over several months, and then, the following December, I was again there with my daughter. And that is the time when we spent together the 9 days and 9 nights that sowed the seeds of what became Sangtin Yatra, then Playing with Fire, and then the organization Sangtin Kisaan Mazdoor Sangathan (Sangtin Peasants and Workers Organization, SKMS). During those 9 days, eight women from Sitapur joined me to collectively imagine the future of the organization called Sangtin that they had registered in 1998 to take forward the work of MS in Sitapur, after MS stopped getting funding from the World Bank. At this point, the vision they imagined was still in NGOized terms of ‘gender-based violence’ and ‘women standing up for their rights and claiming their half from their husbands,’ and so on. But, there was also a lot of critical reflection on what was not working in such NGOized visions and practices and how Sangtin might do things differently to address those gaps. And that is how the journey of Sangtins started. Affective relationships are important, and we’ll get to that in a minute, but I think the most important thing that led to sustaining the work of the alliance was the fact that it was something that the women wanted to do—they were committed to embracing the long term labor of dreaming together and going through the ups and downs of a journey that sought to grapple with interbraided social, economic and political violence in their communities. And this also translated into serious questions about their own livelihoods. As long as there was MS, they would have the 1000 or 2000 Rupees per month of honoraria they were getting as a teacher or mobilizer. If MS would disappear that source of survival would also go. So sustaining that livelihood was an important concern, but the collective reflection entangled that concern with other issues, including the politics of social differences, the elitism, the hierarchies created by professionalism, and the fundamental questions that we come to in the book: what is the relationship between livelihoods of the rural poor and social movements that they participate in? 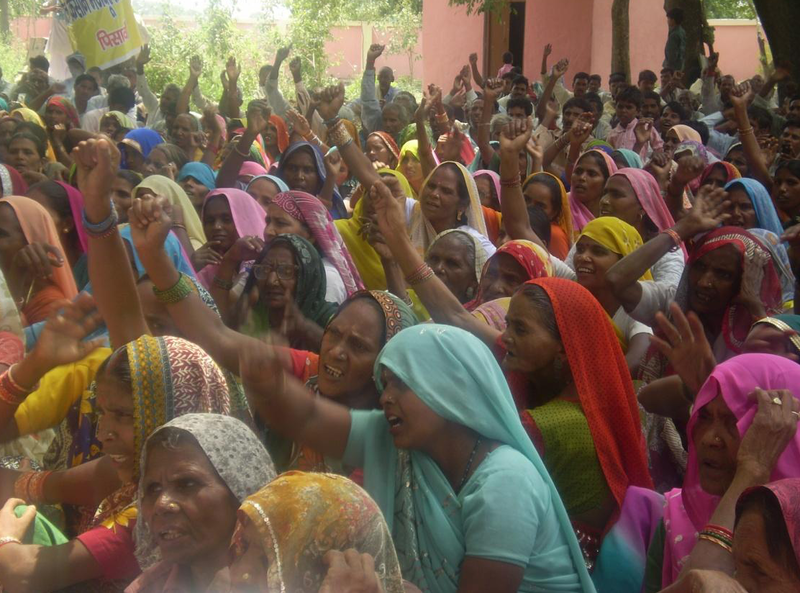 So, if the collective’s dream was one of building and transforming things with entire communities, rather than just with poor or lower caste women, then the question was: what did it mean to internalize a commitment to address violence intersectionally rather than think of it in terms of one or two axes of difference. Once it was clear that Sangtin Yatra was about imagining women’s lives along with the lives of their families and their villages, then it was also clear that this was primarily a journey of affect and trust, of building and sustaining long-term and deep relationships. Although the other eight women already knew each other, the process of collective dialogue and deep sharing was changing their relationships with one another in ways that were just as, if not more, important than their relationship as a collective with me. As far as I am concerned, I think there’s a particular way in which a person from the outside is seen. So, when the “official” gender trainers come to the villages, there is a stereotypical image of women who wear predictable attire, and who sit and talk in a particular way — modes of self-presenting, communicating and connecting that are pretty commonplace now. So the question was how was I different from those who had come before me? I am not the one who will ever know the complete answer to that question, but I would say that there was a long process of testing one another. Sometimes members of the collective would ask me what my computer or tape recorder or shoulder bag cost and compare the monetary value of these possessions to that of their bags or footwear. I, too, asked hard questions. For instance, there was a way in which Richa Singh was always given a special place initially. I would ask, ‘Why does Richa always have to sit in a place where she can lean against the wall and everybody else has no wall to lean against?’ I saw that, at first, people would react to that question and get angry at me: ‘What is your place? How dare you talk about us or raise questions as if we haven’t figured it out?’ But, I think it also allowed people to start asking difficult questions of me. A lot of times it would be about, ‘How much money can you raise from your location and connections?’ Or, ‘what do you make at the University of Minnesota?’ Or, ‘how do you think about your child’s future?’ Such open dialogue led to other discussions. For example, someone would point out that Richa Singh might make more money from MS, but some of the others in the group have bigger bank balances than hers, etc. What was noteworthy was the group’s growing courage to name economic inequalities and various kinds of social privileges that often remain unnamed or unspoken in collective work. And that’s when we felt that we were ready to start writing together. I remember the first writing exercise we did. We all assembled in a primary school in a village and each of us went off in a different direction for two hours to write about her childhood, and then we came back, and started reading our words to one another. It is not like I haven’t encountered inequalities and absences in my childhood, but as soon as I started reading about my childhood in a joint family (where I was raised by my grandparents, parents, Baba, and others), I realized that anything I shared about my childhood was seen as the story of Richa Nagar’s grandfather. One or two of my grandfather’s novels are revered in Sitapur as if they are religious texts. His popularity meant that whatever I shared about my grandmother, for instance, became the story of a well-known figure’s wife. The same kind of thing also happened when Richa Singh shared her stories – they became the stories of MS district coordinator. Immediately, the sangtins picked up on this unevenness of reception of stories. They said to Richa Singh and me, ‘Maybe you should just continue to write your stories. But we may not want it to give them so much space in our discussions because the discussions are about our lives as rural women in Sitapur and your stories do not fit.’. So when you read Playing with Fire, you find the stories of the two Richas missing. You might say, ‘oh you guys told the story of others but didn’t tell your own stories.’ In Indian feminist discourse some distinguish between caste feminism and dalit feminism. Even though not everybody in the collective is dalit, the absence of the stories of the two Richas in one where the Richas can be interpreted as sawarn feminists (who tell the stories of others). However, if you look from the lenses of the collective and how that decision was arrived at, it raises a more complex set of questions about margins, centers, and representation. Once the journey began, there were all these intense experiences of people feeling the pain of untouchability, of people feeling deep mistrusts that could not be broken merely by sharing of words and memories. I think Richa Singh and I were the first in the collective to deliberately start sharing our thalis (plates) with others. So, you’re sitting with this steel thali, and eating with your hands, and the rice, and daal, and roti, and sabzi are all melting into one another. I remember clearly when I first sat down with Chaandni and started eating from the same plate. It was something that registered for her with tears, and for others it was initially a shock, but then it led to other kinds of things. Everyone, I think, was pushing boundaries in their own ways. They were all experimenting with new things, stepping into new zones of discomfort for themselves and others in the collective, because they believed that it was all about creating something that brought more hope, more courage, more possibilities for all of us. And we have some incredibly powerful stories that we tell in the book. For instance, one of the dalit women, Madhulika, was full term when the first overnight diary sharing session happened, and Chaandni, a Muslim woman, delivered her child while the others helped out. This was a kind of scene that was unimaginable given Sitapur’s caste and communal politics. I feel that if the writing of the childhoods and adolescences had not happened first, none of this other sharing and risking of deeply held beliefs would have happened. Sometimes readers in the US classrooms, especially the undergraduate classrooms, become overcome with pity when they read the initial chapters of Playing with Fire, and one senses this narrative of ‘how lucky we are that we don’t have to suffer like those poor women in Sitapur.’ But I remind them that chapters two and three of the book are about the collective sharing of childhoods and adolescence that was key to building affect and trust within the group. That sharing marked the coming together of a group that was wounded and scarred; these wounds and scars were made of painful pasts and painful presents that were alive in the group. It is through the telling and listening and the crying together that trust and affect begins. Then later on in the process of writing diaries we see tensions emerging again when the authors recall the politics of how they got their jobs in the NGO. People recall, ‘oh you got the job because you were a Brahmin, or you were networked, but for me it was such a long series of battles at such a high cost.’ So, those bitter memories and scars continue to surface in chapters four, five, and six of the book. What you see is a complex back-and-forth between the very bitter that cannot be erased and lives on, and the scars that people are willing to share and forgive because they want to imagine something together. But to come back to the question of pity, I remind the students that the chapters about childhood and adolescence are the ones where the group is primarily sharing with one another, whereas the later chapters present a critique that they want to share with the rest of the world. In other words, the boldness and courage of the systemic critique that happens in the book would not be possible without the trusting and sharing that one sees in the first three chapters. To remove those chapters from the larger process of political creativity and vision and make the women into an object of pity is to participate in a huge epistemic violence that kills the spirit of Sangtin Yatra. Six of the nine women who authored Sangtin Yatra/ Playing with Fire could not become part of the movement that became SKMS, because they could not give up their honoraria and jobs in MS. 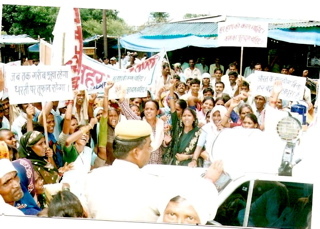 However, several thousand young women and men became part of the movement that began with Sangtin Yatra and that has been able to fight some major battles with Sitapur’s district development administration on questions of minimal employment guaranty act, on access to irrigation and information, and against various forms of discrimination against the poorest dalit farmers and laborers. Building a movement in the way that I have been discussing through the example of Sangtin is inseparable from building a continuous politics of reflexivity, from forever honing an ethics of what it means to be in solidarity. In envisioning and nurturing this praxis – whether in the academy or in activism — it is important to remain attentive to the way peoples’ anguishes and desires play out and create tensions and possibilities. What we are making a commitment to is being together for the long haul in ways that there will be forgiveness when one person in the alliance gets tempted to become a star, or when a newspaper writes a story about you and not about me, or when the media or the public wants to identify a single charismatic leader in a movement that calls itself leaderless. We must be able to struggle with those moments. And that is possible only if there is the trust that allows people the courage to push each other on the shared ethics and politics of accountability – accountability to what brought them together and keeps them together in the first place. CW: These are great stories. Could I ask you to talk about questions around the positions—tense, ambiguous, contradictory positions—you’ve had to find yourself occupying when working in the university? You could speak to some of the kinds of limits that you’ve faced in trying to do this activist co-research in the academy, including how you’ve grappled with those limits and overcome them at different points in your career. I’m interested in your perspectives from occupying different positions in the academy from grad student to tenured professor to administrator. Richa: Let me begin by clarifying about what you are calling a space of activism or organizing. I don’t think I can claim the label of an activist, especially given the locations where I work, and especially considering how differential the terrain of activism is. With my secure livelihood and the kinds of relative comforts and privileges that I have, I always wonder what it means for me to be labeled as an activist? What I was clear about from the very beginning was that I wanted to write and analyze in a creative way. So I feel most secure — in terms of my past, my present, and my future work — when I think of myself as a creative thinker and writer who can trouble set genres. My passion to complicate languages comes from here — not merely the distinctions between languages of experts and languages of ordinary people, but also the divides between Urdu, Hindi, Awadhi, and English; the language of theory and what gets labeled as ‘method,’ all of those things. What I am talking about cannot be reduced to the question of writing style; for me, this question of languages is entangled with important theoretical conversations. The stories that we tell and the ways in which we tell them cannot be separated from making theory. When I was writing my dissertation about South Asian communities in Tanzania, the creative joy that I felt was as if I were writing a novel. I couldn’t do much creative writing in Hindi as a graduate student in the US academy. But as I created the pages of my dissertation I felt as if the novelist in me was coming alive by putting the stories together. I felt that creative joy even as I transcribed and translated an interview or a life story. For instance, I would be listening to a woman talk to me in a mixture of Punjabi and Hindi as I transcribed the interview, but I would be typing it on the computer in English. And sometimes the interviews took place in the streets of Dar es Salaam but I wrote up these stories in the lanes of old Lucknow. Those were some intense creative moments that allowed me to see the possibilities, to appreciate that “fieldwork” could never be about purely transmitting what was said. It has to be about the translations we participate in, about what we have the passion and the “skills” to do. Not everybody feels passionate about the same things and not everybody has the skills to do the same things. Our skills and passions are enmeshed with our histories, our locations, and it is a loss if we don’t pay attention to this, or if we try to erase the knowledges and the ways of knowing that come with those histories and locations. I find myself continuously struggling to blend those ways of knowing, to make them speak to one another. The other thing one learns gradually in this kind of journey is that what one wants to do does not already have a recognized place, and that one can’t easily rewrite the rules. This kind of ever-evolving work cannot be captured in a proposal for a committee of evaluators, prior to the journey itself. The issues that you are interested in are part of a process and you cannot imagine or predict what it is going to look like. And so, when you get a rejection from that SSRC grant competition, or Guggenheim, or ACLS, that is okay. I can’t write a proposal that can pre-translate the creative labor that is going to materialize through a very complex process of dialogue and translation. Almost all the points that I am making are entangled in histories and processes. When you ask me about affect, the question takes me back to Dar es Salaam. A question about the future of the Sangtin movement today returns me to how the story of Sangtins began in 1996. Often, our audiences don’t have the time and space for all of these complex pieces, and that is part of the terrain in which we operate. But if you can imagine and feel secure in the presence of a different kind of interpretive community, then you say, ‘this is the community I have an accountability to and these are my primary interlocutors.’ Then your spirit can sustain the critique that sometimes is warranted and other times might be unwarranted. So, connecting this back to the question of how one can continue to nourish hope while working in a corporatized setting, the only way is to recognize the contradictions in one’s own location and, within those contradictions, try to find a relative sense of security so that you can continue to do the work that you believe in. It is important to be surrounded by discomforts also, but you also need to feel secure in occupying a marginal location in the system in order to sustain these complex translations and creativity that we are talking about. So, for me it’s the essential labor of forever finding the balance that can allow me to go on. This might not seem like a neat answer to your question, but it is connected to it in important ways. When I was invited to apply for the position of an administrator (Associate Dean for Faculty in the College of Liberal Arts) by the search committee chair, Bud Duvall, I was about to turn forty, and I had just plunged myself into my first big theater experiment since I was in my teenage years, and it was a big deal because it was in the Twin Cities and I was hoping to sow seeds for building a new kind of cultural and political platform for community work here. When Bud called me as the chair of the search committee, I asked him if he could wear the hat of a friend for a moment and tell me whether he would still want me to apply for the position, and he said, ‘If there are not prohibitive reasons, then yes, I would seriously like you to apply because you will bring a unique vision to this position.’ Of course, I followed Bud’s advice, and that was the end of my trying to build Hindi theater in the Twin Cities. This was in summer of 2008, within a year of the hunger strike [in solidarity with the AFSCME strike at the U of Minnesota in 2007]. I could not have taken the administrative position if I did not regard it as deeply connected with my other work. So, for instance, if we believe that research, teaching, and activism are all integrated, then administrative work could also be integrated with the same sets of commitments. Administrative aspirations become a problem when they become part of a career trajectory; but administrative labor can and should also be seen as critical labor that is part of maintaining or changing the structures of our own institution. Initially, I signed up for two years. I was told it was going to be a tough time as there were no resources available, and I regarded that as a good opportunity, because it meant that important issues about inequity and transparency will have to be addressed: For instance, the research budgets and retention moneys that different faculty get, the mentoring and support that faculty who do interdisciplinary work need, the rules by which people’s scholarship and teaching are assessed, etc. These everyday institutional processes remain secrets for some faculty while for others they are part of the routine negotiations they carry out in the institutional space. Why can’t there be transparency in the rules and whatever there is for the institution to dish out to the people? This is no radical politics; it’s just about basic transparency in any administrative structure. So, in the time that I was an administrator, addressing these questions was one of my main goals. Since the fiscal picture was bleak and there was not so much hiring or retention activity, there was also time to begin tough conversations and to undertake difficult policy-making on these matters. Also close to my heart were questions of “internationalization”: what does the university do in the name of ‘internationalization’? How is internationalization seen as business, and how are university structures invested in reinforcing, sustaining, or deepening the divide between ‘domestic diversity’ and ‘international diversity’? So, ‘internationalization’ is a big business for many universities while addressing race is a ‘local’ issue, and the money, the offices, and the people who are invested in these dialogues, are all systematically separated. We can talk all we want about the Global North and the Global South, but our universities don’t make conversations across the multiple Norths and Souths easy. Those are the things that I did as an administrator in addition to my day-to-day tasks and responsibilities. And I ended up staying in the office for a total of three years so that I could conclude some of the projects that I had started. The work made me recognize that when we build these compartments between say, the devils called ‘administrators’ and the good people called ‘leftist faculty,’ we evade some difficult questions. The university is a corporatized setting and people who inhabit that setting often have very material desires. Radical ideas produced by those in the university — when juxtaposed with unstoppable desires for recognition, rewards, celebrity, and attention among many of the same people — reveal a fundamental contradiction. If we are not upfront about this basic contradiction in our existence, we are avoiding a very important piece without which our critique remains painfully incomplete. Maybe those of us who produce critical analyses of the university also need to more clearly recognize the university as a source of the material joys and comforts that allow us to enjoy big homes and good wines and meals; to take sabbaticals; to send our children to the best schools, and so on. We might say that, ‘okay this is the source of my livelihood and my huge privileges, but I’m also trying to mobilize some of those privileges in other areas that we might call radical politics.’ But, that is one place where huge silences are present and I can’t say that there’s a critical mass of people grappling with those questions in a public or organized way. CW: I’m hoping that this project we’re doing will help in opening up these questions. Richa: I would like to add that the same is also true of activism or the field of arts, and these problems are not US-focused, they are global. Everywhere stars are created, there are fellowships to be won, and awards to be had. This last year in India, I spent my time learning about histories of social movements, partly for my own understanding and partly to put into perspective some of the things that are unfolding in SKMS. The rapid success of SKMS, and its high visibility has also led to the kinds of contradictions that I mentioned above – for example, individual aspirations that do not sit well with what the collective imagines itself to be. Rather than harp on SKMS and personalize those issues, I wanted to take a step back and learn. Those who have been closely associated with social movements often say that after every 7 or 8 years, a movement either collapses or changes its form in a significant way, and these shifts have to do with questions of institutionalization. In some ways, these are similar kinds of stresses and agonies that we are talking about with reference to the university. The university is a much more organized structure, but the point is that institutionalization of social movements also engenders parallel problems. So, the last year, I was involved with Popular Education and Collective Action, a New Delhi-based organization that has been generating educational materials for people’s organizations throughout India for the last 17 years. I was part of a team that was helping this organization assess what they have achieved through their pedagogical work. But it was also a very valuable exercise for me in a different way as it allowed me to understand the current points of crisis in SKMS in relation to the tensions and stresses faced by social movements across the subcontinent. So, when we raise questions about our own location in academia, we can also ask hard questions about activist and artistic labor and the structures within which that labor takes place. That would increase the richness of our conversation. CW: When I transcribe this, I’ll pull out some open questions and some trajectories that we can use to take the conversation further. Richa: I would love to be pushed, and to hear the hard questions you have, so that we can have hard conversations. This interview with Richa Nagar was conducted on July 11th, 2012. Richa is a Professor of Gender, Women and Sexuality Studies at the University of Minnesota, Twin Cities, and she is a co-author of Playing With Fire: Feminist Thought and Activism Through Seven Lives in India, and co-editor of Critical Transnational Feminist Praxis, along with many other articles and essays listed on her website. ← Occupying Our Education: An Interview with Steve M.